What is the Naomi Prawer Kadar Fellowship? The Naomi Prawer Kadar Fellowship is an excellent opportunity to enhance your Yiddish studies at Columbia through a Yiddish Study Abroad Program. The Naomi Fellowship includes the participation in the Naomi Prawer Kadar International Yiddish Summer Program at Tel Aviv University in the summer of 2019 and in the “Exploring Yiddishland” study trip to Poland, led by a Columbia faculty member. The fellowship includes a travel grant, tuition for an intensive four-week-long for-credit Yiddish language and literature course (80 hours), and housing at Tel Aviv University, a food stipend, as well as week-long travel, accommodation, and study in Poland. Please note Yiddish literature classes (in translation) and Yiddish for Academic Purposes cannot be counted as part of the required 4 points. There are six Fellowship spots for Summer 2019. Yes. 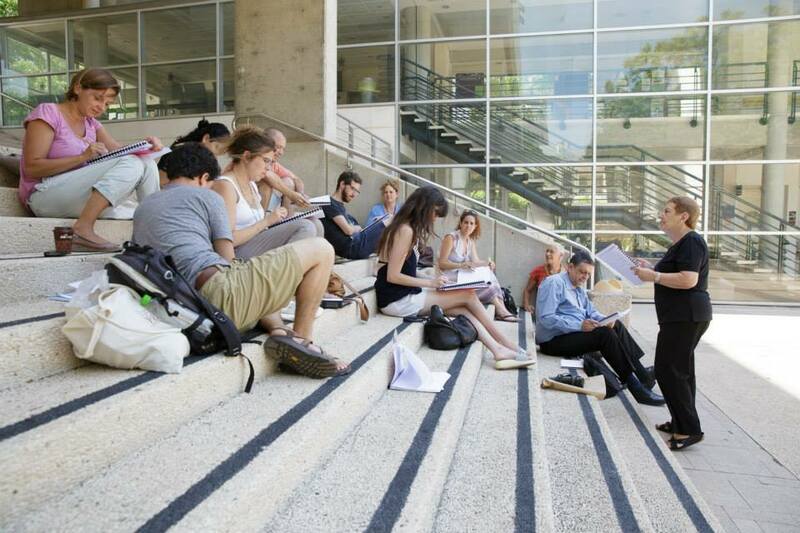 In order to obtain academic credit (4pts Yiddish II, Yiddish III, or 3pts for Yiddish IV or V) for the Naomi Prawer Kadar International Yiddish Summer Program, students need to 1) submit Tel Aviv University transcript for the course; 2) score accordingly on Columbia’s placement exam; and 3) complete the next higher level of Yiddish language class(es) with at least a grade of B+. All awardees must complete the placement exam upon return to Columbia and before registering for Fall 2019 Columbia Yiddish classes; level of placement within Columbia’s language program depends on placement test results. What do I have to do after the Fellowship? Returning students are also requested to write three blog posts about their Naomi Prawer Kadar Fellowship experience for the website and must submit a written report for the Naomi Foundation in English (if possible with photos of participants on site in Israel and Poland), no later than September 15, 2019. In addition, the Naomi Prawer Kadar Fellows must commit to at least three semesters of continuous Yiddish language instruction at Columbia: either two semesters before the summer program and one after, or one semester before the summer program and two after. Thus, the Naomi Prawer Kadar Fellowship will enable students to acquire at least 16 points that can fulfill the Columbia language requirement and, additionally and significantly, can count toward a Concentration in Yiddish (24 points required) or Major Track in Yiddish (30 points). Deadline for completed applications is Monday, April 15, 2019. Applications must be submitted online through the Office of Global Programs and Fellowships. Who is behind the Fellowship? The Fellowship is a program of the Institute for Israel and Jewish Studies, together with the Department of Germanic Languages. We thank to the Naomi Foundation for their generous support of the Fellowship.